The UK's first all-vegan supermarket has launched a plant-based 'steak' - which is available instore and online. 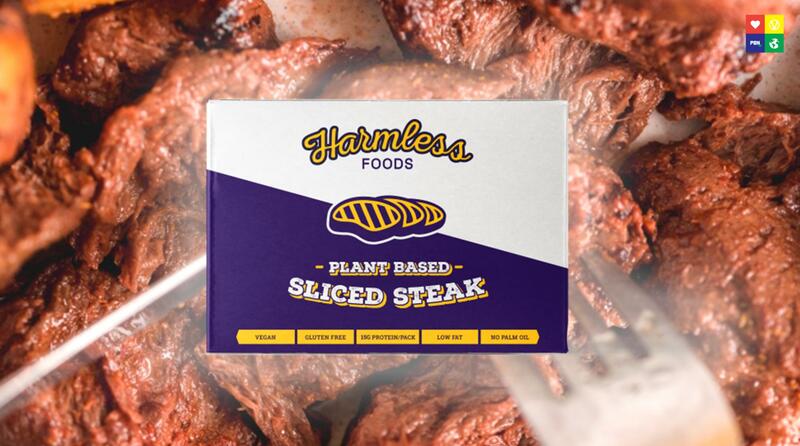 Greenbay, which is based in west London, has released the product under its 'Harmless Foods' line. The Plant-Based Sliced Steak, which 'looks, cooks, and tastes like meat' is made from soy, beans, and spices, according to a statement sent to Plant Based News. "Our aim since we first opened GreenBay back in 2016, was to make going vegan easy and convenient," added the statement. "Our London Supermarket is a one-stop-vegan-shop, where we offer an extensive range of plant-based food products ...cruelty-free beauty and hair products, cleaning supplies, and even dog food. "Everything you would find in a conventional supermarket – that just happens to be vegan. In addition to our London store, and due to increased customer demand, in 2017 we launched our Online Supermarket, which currently ships thousands of products - including a huge variety of chilled items - across the UK & Northern Europe on a Next Day Delivery service. "Our aim as a company has always been to educate and encourage people to adopt a kinder lifestyle, and Harmless Foods was the next natural step on this journey." Paula Alcalde, Managing Director and Co-founder and Managing Director of GreenBay told PNB that the company decided to do a steak because there are already many vegan alternatives to products like burgers, sausages, but not as many steak replacements. "Food is linked to values and traditions and we know that just like bacon, steak is one of the most loved 'foods amongst non-vegans, and one of the things they find the hardest to give up," she added. "So it just made sense to do something that we believe might help people break that barrier." Alcalde herself played a key role in developing the product: "As a small business we don’t have the infrastructure nor equipment/resources required to produce food at a high volume and our manufacturer was able to guide us and provide invaluable advice all throughout the process; I was fully involved in both the development and branding process, and Anderson in logistics & finance," she said.